While some of today’s workforce is made up of deep-rooted, dependable staff, a larger portion of roles are transitioning into revolving doors of employee turnover. This impacts customer service, productivity and profitability. The only way for organizations to successfully and sustainably face the new realities of today’s workforce and the evolution of employee expectations is through a deep understanding of how to effectively hire and manage shorter-term workers who have a different view of the workplace. 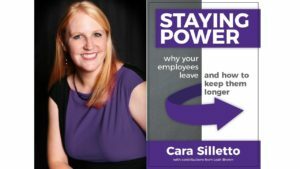 This insightful, breakthrough book by Cara Silletto and contributing author Leah Brown is designed to help leaders at all levels discover exactly how our workforce has changed over time, why employers are struggling to keep talent and how to gain better staffing stability. My book never would have made it to the finish line without Cathy! To order your copy from Amazon, follow this link.